Before the 1940s, chicken was rarely seen on the dinner table. “Birds for eating were byproducts of egg production of ‘spent’ hens,” writes journalist Maryn McKenna in her book Big Chicken: The Incredible Story of How Antibiotics Created Modern Agriculture and Changed the Way the World Eats. McKenna traces how the use of antibiotics not only turned poultry into everyday meals, but how it has contributed to the current antibiotic resistance crisis. She follows Salmonella outbreaks, small farmers, and big industry producers to reveal how these drugs have led the poultry market (and our taste) to embrace the prized protein. She discusses how these two industries can break their dependence on one another. Read an excerpt of McKenna’s new book, Big Chicken. Maryn McKenna is a science writer and columnist for Wired. She’s also the author of Big Chicken: The Incredible Story of How Antibiotics Created Modern Agriculture and Changed the Way the World Eats. IRA FLATOW: This is Science Friday, I’m Ira Flatow. Chicken! You know, it’s certainly a staple of the American diet, but it wasn’t always that way. Remember the promise of a chicken in every pot? That was promised back in the day, because few people could afford the high price of chicken. Chicken dinner was not a really common meal as it is today, because there were too few chickens. The price then was just too high. So in the early 20th century, chickens, as food, were the byproduct, the leftover of eggs for farmers. So once the hens stopped laying eggs, they ate them. So how did chicken become the go-to Sunday dinner meal? My next guest writes about the secret ingredient that might surprise you. We’re talking about antibiotics. In her new book, she traces how antibiotics propped up the poultry industry and has contributed to the current antibiotic crisis. And here with that story is Maryn McKenna, her new book is called Big Chicken the Incredible Story of How Antibiotics Created Modern Agriculture and Changed the Way the World Eats. Welcome to Science Friday, welcome back. IRA FLATOW: It’s really a very interesting story. I learned a lot of new things about chickens and antibiotics and the whole history of chickens. Why did you focus on the chicken industry? I mean, every type of livestock gets dosed with antibiotics, right? MARYN MCKENNA: It’s true, but chicken taught the rest of agriculture, the rest of meat production, how to use antibiotics. Chickens were the first animals to get what we call growth promoter antibiotics experimentally. And they really bracket this story in an amazing way, because chicken, of course, is the meat that we eat more than any other in the United States. Chicken nuggets are a staple of everyone’s diet, but chicken is actually passing out of antibiotic use. 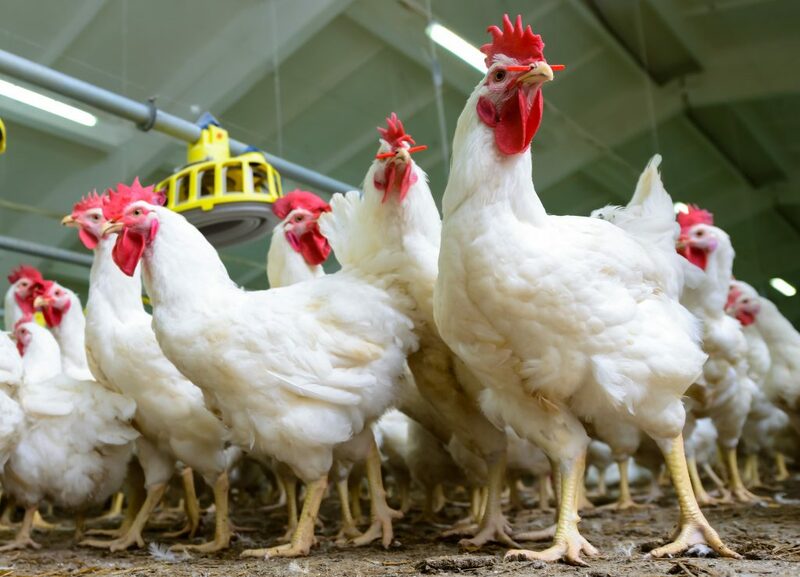 In the US, major chicken production is kind of sacrificing or turning away from antibiotics, and maybe it will teach the rest of meat production that lesson too. IRA FLATOW: Let’s go through some of the history of this. Because in your book, it’s quite fascinating. Going back to the time, when we think about animals and being– they’re fed antibiotics, right? But you were talking about how chickens were dipped in antibiotics. Tell us that story why they were dipped in it. MARYN MCKENNA: This is a crazy story. And when I first started stumbling across it, reading footnote after footnote and seeing references to this, I couldn’t believe it. So antibiotics come out from the mid to the end of the 1940s, and almost right away, they’re being given to animals as part of their diets, as you mentioned, in order to make them fatter and to protect them against diseases in the very large farms that are growing up at that time. And it seems to be so safe. No one can see any downside, that a couple of researchers and food production companies start to think, if it works inside the animals, then surely it would work just as well or maybe better outside the animals. And the company that started this whole antibiotic use, what was literally laboratories part of American Cyanamid, starts using its drug, one of the first tetra cyclones, as a bath, like a brine for chicken and for fish. They dip raw butchered chicken and fish into a solution of antibiotics, and then package it and send it off to supermarkets. Their idea is that the antibiotic on the surface of the flesh will kill spoilage bacteria. And so instead of having chicken on the shelf or in the cold case for two or three days, you might be able to keep it there for two or three weeks. IRA FLATOW: Wow, two or three weeks? IRA FLATOW: And as you mentioned in the book, that was an advertising way, right? To show that our chicken’s better than your chicken because it has been what’s being called acronized, or acronization. MARYN MCKENNA: Right, exactly. Now, I had never heard of this process. And in fact, among the many people that I spoke to for the book, there were very, very few people who knew about it. I even checked with the archivist of the FDA, and they had no record of it. But then I looked back in old newspapers, and in plenty of advertisements in local newspapers for local grocery stores, the kind of advertisements that say, pork chops are on sale this week, and three for two on bunches of bananas. There would be the seal, acronizing, our chicken is acronized. They were really proud of it. IRA FLATOW: [LAUGHS] That’s crazy. Our number 844-724-8255, 844-SCI-TALK if you want to get in on the conversation talking with Maryn Mckenna, author of the Big Chicken the Incredible Story of How Antibiotics Created Modern Agriculture and Changed the Way the World Eats. Now, there had to be scientists back then who saw this happening who said, don’t you know what you’re doing? You’re going to create these super bacteria, right? I mean, they know how this stuff works. MARYN MCKENNA: So one of the interesting things to me in researching this story, which is a story that starts at the beginning of the antibiotic era in the 1940s and continues right up to the present day, is that I had the impression that talking about antibiotic use in agriculture as a thing that we should avoid and criticizing it and linking it to superbugs was a pretty recent development. And I was really shocked to find out that right from the start, some prescient researchers were saying, this is going to be a mistake. This is going to womp up bacteria into superbugs. In fact colleagues of the chap who started all of this, who made the very first experiment, warned in their own company that this should not happen, that there was going to be a negative result. But profit won out, and we got to the situation we have in agriculture today. IRA FLATOW: Let’s talk about chickens today. Chickens today don’t look like anything you like to see in the wild. They’re grown for their breast meat, so just like turkeys, they’re out of proportion. And you describe them as olives on toothpicks. And you trace it back to something called chicken of tomorrow contest. The chicken of tomorrow. MARYN MCKENNA: I just love this story. So giving antibiotics routinely to farm animals starts a lot of things rolling. It starts the concentration of animals into barns, it starts the efficiency of modern meat production. But chickens, as you mentioned when we started, chickens were initially the things that just laid eggs. And by the time a chicken is done laying eggs, she’s kind of scrawny and not necessarily very tasty. All of her energy has gone to the eggs. And so this nascent chicken industry wanted to come up with a tastier chicken, a chicken that people would pursue, would want to eat. And so they held this contest. It was sponsored by the AMP supermarkets with the assistance of the USDA to create a chicken that just had more meat on it, that was more muscular. They described the ideal chicken as having breasts that you could slice like a steak. And so from 1948 to 1951, they held a nationwide contest in which people competed to come up with just chunkier, meatier chickens. Chickens especially with the breast meat that Americans want to eat. And most of the chickens that are now produced in meat production in the United States are descended from the genetic lines that were developed for that contest more than 60 years ago. IRA FLATOW: You also talk about so many interesting stories in there. Let me get back to a point first that you made at the beginning, and that is the race to not put antibiotics in chickens now. I would think it’s because people are more health conscious and they look for more natural products. Is that the reason why we’re seeing more of this now? MARYN MCKENNA: I think so. You know, it’s only been in the past couple of years in the United States that we’ve really started to turn against the routine use of antibiotics in the animals that we turn into meat and eat. And that’s really interesting, because Europe has had a ban on at least some of these antibiotics for more than 10 years now, but in the United States for a variety of reasons, any kind of government action was held at bay for a very long time. But in its absence, a consumer movement grew up out of health care institutions, and school systems, and farmers, and chefs, and concerned parents all saying, we think these practices put our children, our families at risk. They are contributing to the rise of superbugs, they are reinforcing a system of farming that is not healthy for animals or for humans, we want to see this change. And they started to vote with their dollars. IRA FLATOW: Yeah, the FDA only started moving on this issue, what, about three years ago? MARYN MCKENNA: That’s right. In the last days of 2013, the FDA announced sort of a break in the long stalemate between government and industry over these practices and the final version of the rules, which took growth promoter antibiotics out of the mix in the United States, but still allow preventive antibiotics to keep diseases at bay in crowded barns and feedlots. Those only went into effect in January 1st of this year. IRA FLATOW: That’s so much for this country. What about other countries that always say, well, we’re not as developed as you are. Let us get our own chickens. We want to be able to eat like Americans, you know? MARYN MCKENNA: [LAUGHS] You know, to me the international fight that’s coming over the use of antibiotics in meat animals really is very reminiscent of the fights over climate change. Not just in the sense that this is an enormous problem and what any one person does feels so insignificant, but also that the industrialized west is far ahead of the global south in this. And the industrialized west is saying, well, we had all these massive cattle farms and we had our juicy steaks, and developing world, we would like you to forgo that part of your evolution. And the developing world is appropriately saying back, wait a minute. Our people want their juicy steaks, too. We too want to have factory farms, we want to have lots of cheap meat. How we solve that is a really important question for the next few years. IRA FLATOW: Let’s talk about when this idea that antibiotics and chicken might be linked to human illness. When did that start to happen? You recounted a really interesting detective story dealing not with the consumers, but with an outbreak of illnesses in workers in the chicken processing plant. MARYN MCKENNA: Right, so this actually goes back to that weird process of dipping raw chicken in antibiotics, that process of acronizing. A very alert physician in Seattle in the mid 1950s, someone who had been one of the first disease detectives at the CDC, noticed that he was hearing– he worked with the public health department, and he was hearing from doctors all around Seattle when Seattle was a smaller city than it is now. And they were all treating workers in slaughterhouses who had strange lesions on their arms and hands. And it turned out that they all worked for slaughterhouses that were using this antibiotic dipping process. What had happened was that the chickens and the various farms were already getting antibiotics for all the reasons we’ve been talking about. And then they got an extra dose of antibiotics as they were being disassembled into meat. And that was enough to turn bacteria on the birds and in the birds that was coming out as they were disassembled into superbugs that then were affecting the workers. And because they were scattered around the city, it took someone who had knowledge of the whole city as a public health department epidemiologist to put all the pieces together. IRA FLATOW: Was this a salmonella outbreak that we’re talking about here? And we know salmonella outbreaks are tied to antibiotics in the food system, that makes sense. But this is also affecting our health in ways we might not think of in an increase in non-foodborne illness, correct? MARYN MCKENNA: Right, this is I think one of the most troublesome aspects of this problem is that I think over the years, we’ve almost become accustomed to the idea that we have very large outbreaks of foodborne illness in this country as food production got both more concentrated and also spread its products further across the country. There was a very large outbreak just a few years ago of chicken originating in California, victims ended up in I think about 30 states. So we think of salmonella and campylobacter and so forth as things that we are risking when we eat, even if they’re antibiotic resistant. But the newest research into the possible effects of this widespread use of antibiotics routinely in meat animals points to a completely different effect. And that is to what some people would consider an epidemic of urinary tract infections and kidney infections coming from them, and other more serious conditions like septic shock. Because the bacteria get into your guts just as they do for a foodborne illness, but then they exit your guts and get into your urinary system, and climb up to your kidneys and resist treatment, because they’re antibiotic resistant. One estimate is that possibly 10% of the UTIs and kidney infections caused by E. coli in this country are caused by this foodborne antibiotic resistance, which would mean it could be 600,000 cases a year in the United States, not linked back to farming because the trail of evidence is too long and thin. IRA FLATOW: I’m Ira Flatow. This is Science Friday from PRI, Public Radio International. Talking with the author Maryn McKenna, author of the new book called Big Chicken. We have some people who are not chicken to call in, so to speak. I’m sorry, I had to get that out of the way. Let’s go to Daniel in Kentucky. Hi, Daniel. DANIEL: Hey, how are you? DANIEL: Well, I have a question. I’ve been in the chicken production for 20 years now. We house 24,000 chickens per house, and the thing that did concern is antibiotic residue is a meat that they consume. And of course, we’ve been antibiotic free for 10 or 11 years now. But in cattle, we also raise cattle, we do use antibiotics when they’re needed, but the blame is that superbugs of humans are being blamed for antibiotic residue in the meat that people consume, and I was wondering if there is any studies that actually reinforce that concern. IRA FLATOW: All right, good question. MARYN MCKENNA: So there’s a bunch of things in your question, let me see if I can pick them apart. Congratulations on being a no antibiotics ever producer. That is an amazing evolution in poultry production in this country. And I met so many farmers, most of whom are not mentioned in the book, who have been through this journey, and it’s been fascinating how excited farmers are to make that change. So first, the question of residue. What we’re talking about here is really not antibiotic residue in the meat. That’s something that’s actually regulated by the federal government, and there are quite strict penalties. The problem is that the animals get antibiotics through their feed and water, the antibiotics go into their guts, and they affect the bacteria that are already resident in the gut, and then they exit the animals as manure. So the manure either is in the guts when they’re slaughtered and gets on the meat, or it passes into the environment and carries the bacteria into dust, into groundwater, surface water, moves away from the farm, in some cases, even moves away on the clothing and skin of farm workers. The evidence that that transit happens and that people are made ill by those resistant bacteria that have been caused to happen in the animal is really strong now. I mean, hundreds and hundreds of scientific studies. And the evidence has gotten stronger as molecular laboratory tools have gotten more sort of fine grained so that now you can do whole genome sequencing, and actually track a particular plasmid, a particular piece of DNA back through the chain of evidence. When these concerns first arose in the 1950s, these were observational epidemiologic studies, but now we can actually do lab work to back it up. IRA FLATOW: Maryn, interesting book. Maryn McKenna’s new book is called Big Chicken the Incredible Story of How Antibiotics Created Modern Agriculture and Changed the Way the World Eats, and you can read an excerpt from her book on our website at sciencefriday.com/chicken. Chicken Thank you very much, Maryn, for taking time to be with us today. Which Came First: The Chicken Or Antibiotic Resistance? In her new book, Maryn McKenna unspools the misuse of drugs, and chronicles how food animals may have created bacteria more resistant to human medicine. An excerpt from "Pig Tales: An Omnivore’s Quest for Sustainable Meat."